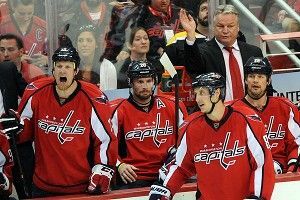 Dale Hunter has radically altered the Washington Capitals. He’s slashed the ice time of the club’s franchise forward, Alexander Ovechkin. He’s taken a team that used to be the exemplar of run-and-gun hockey in the modern NHL and converted it into a buttoned-down, defense-first bunch. Is it brilliance, or is it madness? Hunter’s counterintuitive approach isn’t new, but it caught national attention in the second round of the NHL playoffs. In the second game between Washington and the New York Rangers, Hunter did something unprecedented. He played Ovechkin for just over 10 minutes at even strength, with another three on the power play. Of the 18 skaters the Capitals dressed that night, just three — Keith Aucoin, Mike Knuble, and Alex Semin — played fewer minutes at even strength than Ovechkin. But the story wasn’t just that Jay Beagle ended up playing more minutes than Ovechkin; the story was that Beagle plus 13 other guys played more than the guy who has won two of the last four league MVP awards. The strangest part was that it isn’t even clear that Hunter’s decision was entirely wrong. Ovechkin’s been terrible for the Capitals in the playoffs. Hunter has tried. Ovechkin is averaging about 16 minutes of even-strength ice time per game. The Capitals’ star is getting most of that ice time in the attacking zone, too — discounting neutral zone face-offs, more than 60 percent of Ovechkin’s even-strength work has started in the offensive end of the rink. None of the Capitals’ other top nine forwards start more shifts in the offensive than defensive zone. Beagle, the undrafted yeoman who has had the misfortune of landing front-and-center in this story, gets more than twice as much work in his own end as in the opposition’s. Despite Hunter’s careful deployment of Ovechkin, the Capitals have been hammered with their captain on the ice. In an average hour of even-strength ice time, the opposition outshoots Washington 30-to-19 with Ovechkin on the ice. With Beagle on the ice, that figure drops to 25-to-19 — despite the fact that Beagle’s being started in the Capitals’ zone. Ovechkin’s flaws haven’t been limited to poor two-way play; he’s come up short offensively. He has four even-strength points in the playoffs, which puts him one back of the team lead, but that’s deceptive. On any given shift, five other Capitals forwards are more likely to score a point. In an average hour of even-strength playoff ice time, Ovechkin has scored 1.02 points, while fourth-liner Mike Knuble has scored 1.52 and checker Joel Ward towers over Ovechkin at 2.05. The problem isn’t that Hunter has slashed Ovechkin’s ice time; that was a natural and defensible reaction to his poor play. The real problem is the play of Ovechkin — and the Capitals as a whole — under Hunter. There was no obvious collapse when the Capitals made a coaching change earlier this year. The shift in style was readily apparent, but going from 12 wins in 22 games to 30 in 60 isn’t the sort of drop that generates headlines. What happened was a dramatic decline in puck possession and a sudden loss of territorial advantage. There are no statistics that directly record puck possession, but shot data is a good proxy. The combination of shots and missed shots generally shows which team is controlling the play on a given night, and the Capitals have been in the driver’s seat all too infrequently, though that hasn’t always been the case. Bruce Boudreau’s Capitals, the club that won 12 of the season’s first 22 games, took 52.5 percent of those shots at even strength to the opposition’s 47.5 percent, clearly indicating overall control of the play for the majority of the game. That has reversed itself under Hunter; now the Capitals take 47.5 percent of shots while the opposition takes 52.5 percent. That about-face in possession has had consequences for the battle for territory. Under Boudreau, the Capitals averaged one more face-off per game in the offensive versus defensive zone. Since Hunter took charge, the team has taken four more face-offs per game in their own end than in their opponents’. That change has resulted in a lot more own-zone shifts for most Capitals players. Perhaps the hardest-hit was John Carlson. The young rearguard had been given more time in the offensive than defensive zone while Boudreau was coaching; the switch to Hunter brought with it a heavy defensive load, with Carlson starting 217 more shifts in the Capitals’ zone than in the opposition’s. Both Backstrom and Ovechkin, even in their poor offensive years, have continued to drive possession. The hiring of Hunter brought that trend to an abrupt halt. To date, the only proof that Hunter’s hiring has benefited the team is the Capitals’ first-round win over the heavily favored Boston Bruins. As far as proof goes, it’s decidedly limited. The Capitals were able to record more scoring chances than Boston in just one of the series’ seven games. All seven games in the series were decided by a single goal; four of them went to overtime. Washington lost every game in which Braden Holtby made fewer than 30 saves. Success, such as it was, came by the slimmest of possible margins and despite the fact that the opposition held the balance of play. The Capitals have been better against the Rangers than they ever were against Boston, in no small part because the teams’ styles mirror each other closely. The games are tight and low-scoring, and New York has failed to carry the play the way the Bruins did. Hunter put a stop to that. The Capitals’ high-flying offensive ways are a thing of the past; they now more closely resemble Jacques Lemaire’s Minnesota Wild than their former selves. If Holtby can keep stopping everything thrown at him, that revamping will look brilliant. Against teams like the Rangers, teams content to mirror Washington’s defensive shell, it will at least look adequate. As long as that happens, it doesn’t matter that the new system kneecaps the team’s best players, or that it cedes the lion’s share of territory and puck possession to the opposition. If it stops, though, the strategy is apt to smack more of madness than genius. Jonathan Willis writes at the Edmonton Journal and Oilersnation, and is also a co-author of Hockey Prospectus 2011-12. Follow him on Twitter at @JonathanWillis.